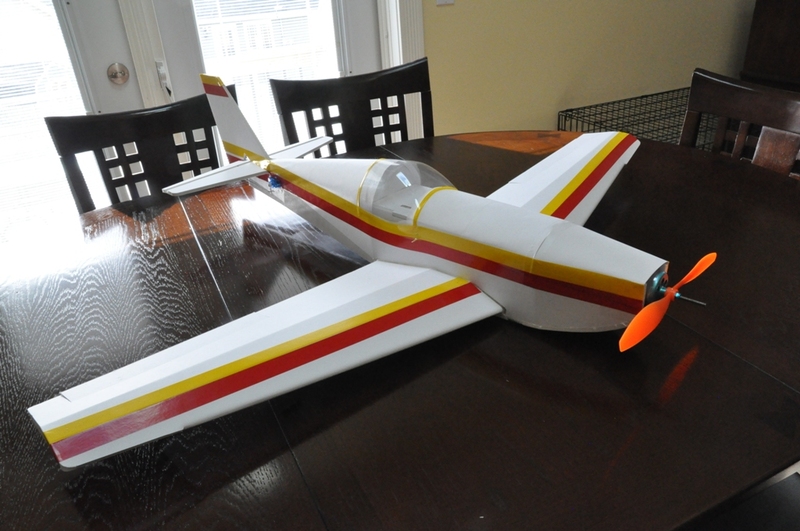 I've watched all of the swappable series videos and loved the idea of building my own plane (I only have a very small Firefly trainer ATM) but thought that for the work/time investment that most of the plans require it might not work as well for me as a beginner (I'm too poor to buy speedbuild kits). The spitfire was the first plane I saw and thought, "I really wanna build that", but I didn't have enough time then, and now the Racer has come out and I loved the build and review episodes and just had to build it. 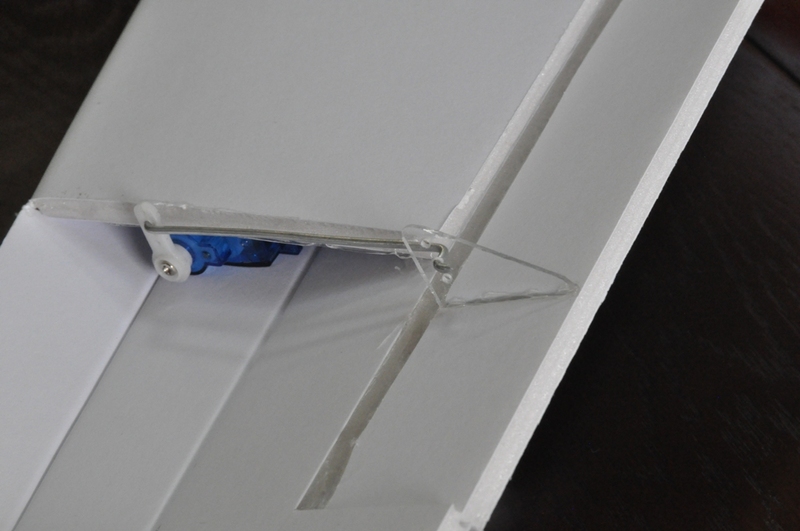 I made a few changes during the build process (like glue-hinges all around) and I contemplated making a removable wing, but I like the design as it is. If the weather cooperates, I'll be flying it tomorrow morning before class and I'll let you all know how it goes! You did an excellent job with this build. I'll be happy if mine is half as nice as this one. Took her out first thing this morning before class, and she flies like an arrow! Took a couple of tries to get the "throw and then fly" launch method down, since this is my first scale plane, but after that it was all butter. I did notice that at slow speeds she has a greater tendency to stall easily in a little wind but I have a new motor/prop combination on it's way to replace the current DT750 and 10/4.5 SF prop (this setup is good for trainer but not for speed). I can tell in the air that she wants to go faster, much faster, so when I get some more fly time in and install the new motor and such (I'm building a different power-pod for the new motor) I'll hopefully have someone with me to get a video. 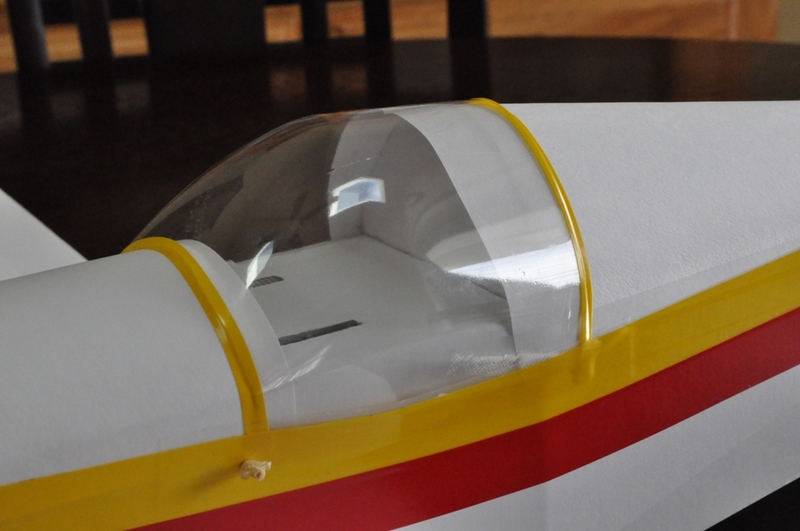 Question for the veterans: I noticed some stress marking on the prop blades right next to the shaft, is this normal for the plastic props to do when at full speed or is it because I'm overtaxing them? 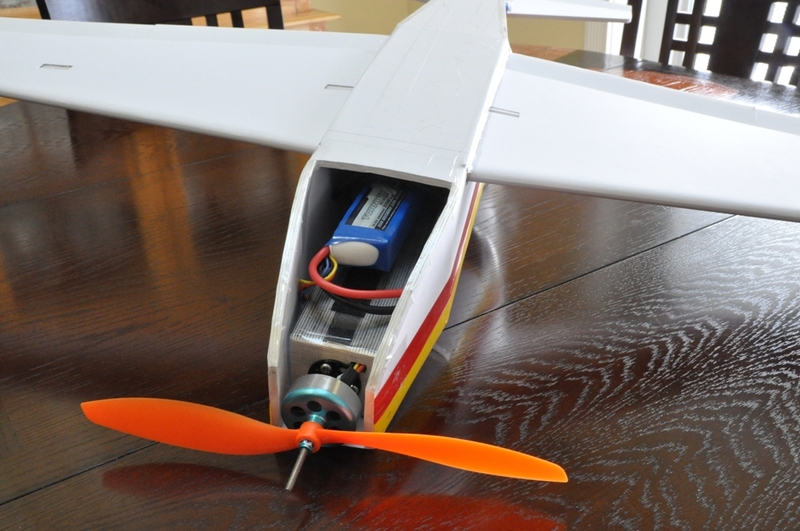 My motor never got really hot while I was flying, nor did the ESC or battery, so I'm pretty sure I wasn't flying them too hard. A note to people who might like to try this plane: When going fast enough (above stall speed) this thing is like an arrow and the wind almost doesn't touch it when going straight. I was a little slow at first and a gust of wind would push me around a lot but when I maxed the throttle and the speed was nice and steady the plane didn't budge in the wind. I can't wait to get her out again! PS: I'm writing this update from class, hope the prof isn't on flitetest! Stress marking on the props is not "normal" but can come from a variety of things. You can bend them on landing if the motor is windmilling or prop has stopped vertical, but also just like you mentioned, by overtaxing them. You can stress a prop without taxing the motor which can cause the stress markings. Try a new prop and see if you get the same markings just from flying. Or go to a larger or steeper prop and test your amp draw again to be sure you aren't hurting any electronics. 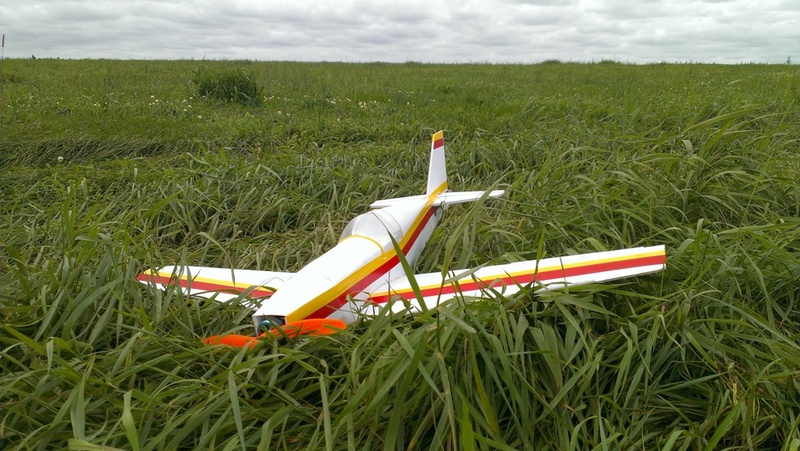 I did make a couple of hard nose landings (I manage to hit the SINGLE fence post in an entire field!) and that might have bent them. 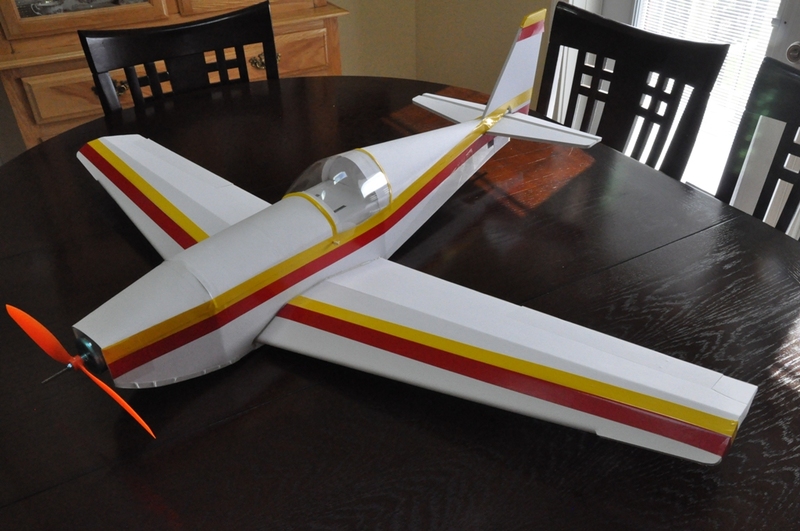 If I get a chance I also might put on a new prop and benchtest the draw to see what it's doing, but I do also have a new set of props and motor (a 1800kV Turnigy and 8x6 and 9x5 props) on the way to me now. I only used that motor and prop config since they're spare parts from my Tricopter (which I haven't had to use many spare parts for because of David's awesome crashable design!). 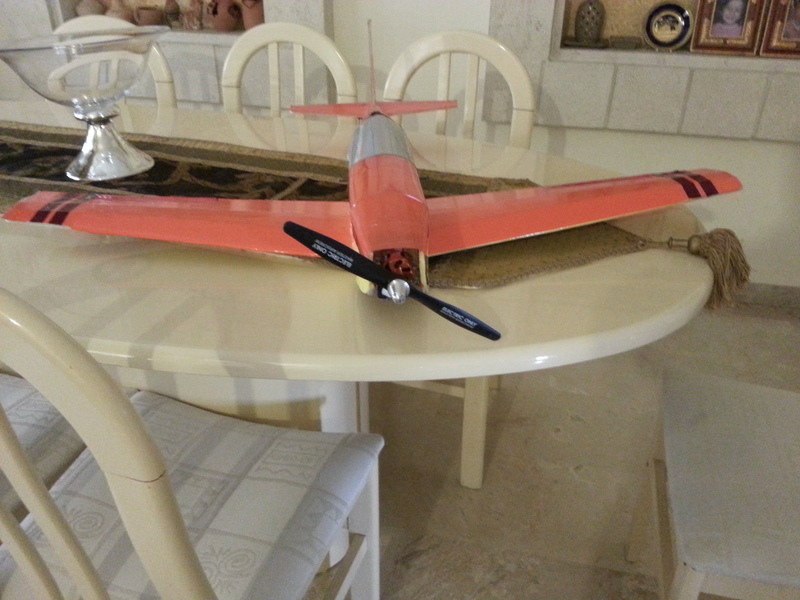 So when I get the new parts I'll be first trying the new prop and then later upgrading the motor to a proper speed motor when I feel confident flying that fast. I have seen those stress marks on some of my GWS style props (actually, the prop on my Spitfire has those stress marks right now), but like xuzme720 said above, I suspect it was caused by some type of impact while landing. Be sure to check the prop well before flying with it, because from my experience it will eventually break at that stress point. That's one nice looking plane! On my list, after I fly the Spitfire and the Versa and the Bloody wonder and the . . . .
You really did a great job with that build! Love the design you created with the e-tape. It's amazing how such a simple design can make such a difference in the way the plane looks. The only thing that scares me a little, is that motor shaft sticking out on the front......ouch. I'm starting to think everyone on this forum is on the same brainwave. I want to build every plane I see on here as well. I echo the thoughts of the others, GREAT job on the build of this plane. She is gorgeous! Jaxx, I know right? if one thing these swapables did for me is get over the fear of crashing and waiting on parts. Plus, you hear how much of a quality design each plane is and it makes me want to build and fly them all. For a while there, I was beginning to think I had a problem. Good to know that it's not just me. As a prof who teaches, I approve. 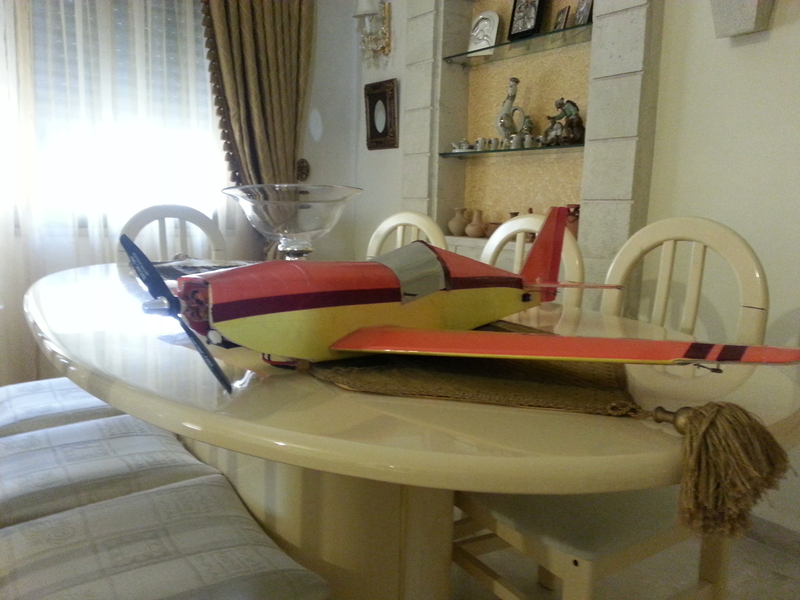 Hope the FT Slinger flies as good as you write-Iam in pogres of making one, and intend to try to flie it full FPV!